There was a lot to catch the eye at the village fair. It was a bustling scene with bright colors everywhere: animals, produce, people touting their wares. But to one attentive visitor, nothing stood out more strikingly than the woman holding a video camera. "Excuse me, miss; what is your name?" he asked, bemused yet polite. "Tuli Begum, sir," replied the woman. The camcorder sat easily on her shoulder, contrasting vividly with her faded, poor-quality silk sari. "Why do you have a video camera?" Tuli is a village woman from Dar Gram, about 60 kilometers north of Dhaka, the capital of Bangladesh. She and her family struggled to get by until she joined Proshika, a social development organization that works with the rural landless poor. Having learned the value of united action on community issues, Tuli organized a Proshika women's collective in her village. 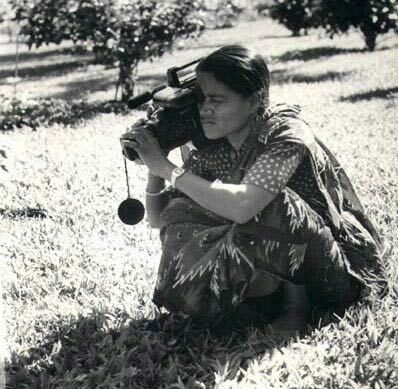 Tuli gained video skills through training workshops conducted by Communication for Change. From the start, she was undaunted by the equipment. The men at the training center were impressed; they hadn't thought that women could do such work. Tuli's husband was harder to impress. When she first started using the video gear, he was suspicious; he thought she was doing something unfitting. It took time and effort to gain his approval, but now he's supportive of Tuli's work with the Proshika video team. In response to the man's question, Tuli explained that she made videotapes about community concerns, so that issues could be discussed and solved collectively. But video production was not really women's work, he suggested. Shouldn't she instead be at home? Tuli had a ready reply. Citing a popular proverb - "Husking machines are always husking whether they are on Earth or in heaven" - she observed, "We women are like husking machines because we are always working, wherever we are." She continued, pointing out that her group's video work had given them access to many people in the community, including decision-makers like himself. And the District Commissioner had to acknowledge that, had it not been for the camera on her shoulder, he would not have spoken with the woman in the faded sari.